Few will deny that theatre has its origins in religion. While civilizations grew, some type of religion evolved as various gods were worshipped and ceremonies and rituals to honor these deities were developed the world over. Distinctive features of these rituals contributed to the elements of what we now call theater. The intermediary between the gods and the worshipers, i.e. priest, shaman, clergyman etc., contributed his words – developing dialog, his gestures – creating acting and even dancing, his voice – vocalizing into singing. Other components employed in the rituals would add music, masks and even make-up which aided in the formation of theater. Not all historians, however, agree about when the beginning aspects of theatre first appeared. 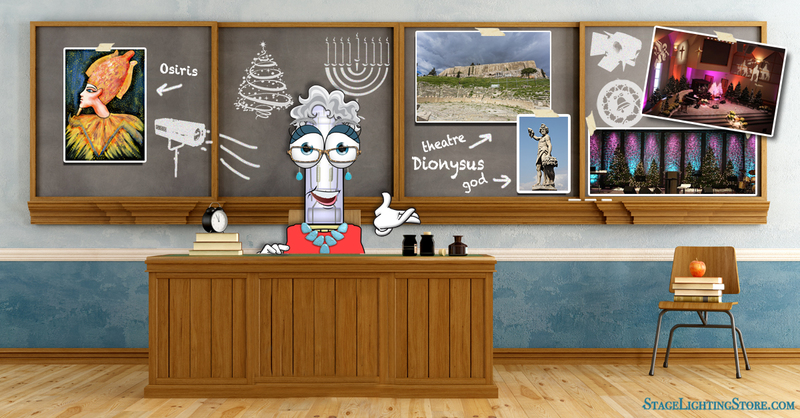 Most point to the religious ritual and ceremony in the worship of the god Dionysus, god of wine and fertility for Athens in ancient Greece around 700 BCE. Hymns, termed dithyrambs, were sung by a chorus of about fifteen worshipers to honor their god Dionysus. The chorus would perform in future years as a procession wearing costumes and masks, and, still later, some of its members would take the part of special characters, introducing proto-actors. However, placing the introduction of theater back to the Hellenistic period of ancient Greece negates the influence of the Egyptians from as far back as the 2000s BCE. Passion plays honoring the king-god Osiris, his death and resurrection, were performed each year in Abydos, Egypt around that time, far earlier than the old Greek theatricals. Some historians actually put the writing of the original Osiris drama as far back as 3200 BCE. Although theater continued to evolve around the world, it began to disintegrate in Europe after the fall of the Roman Empire. It was practically non-existent in that region during the period known as the Dark Ages. Again, religion was prominent in returning theater to its present state. A chant, Quem Quseritis, from a tenth century Easter mass is credited with the revival of theater. During the Matins service on Easter morning, this chant was enacted as a intimate scene of question and answer dialog among a few worshipers. From this minuscule performance, theater evolved into today’s gigantic entertainment entity according to historical scholars. Given the role religion has played in creating theater, what can the theatrical world do for today’s religious institutions? One answer is stage lighting. During medieval times huge Gothic cathedrals were designed in order to bring more light and space into them so that the many religious relics being brought from the Holy Land during the Crusades could be displayed and seen. But no matter how large the churches’ windows became, they were positioned seventy to eighty feet above the floor and never allowed enough light to enter and illuminate all the exquisite objects and architectural decorations contained within. The artificial lighting of the time, oil lamps and candles did little to help. Imagine what today’s stage lighting, such as a pin spot, could do to highlight a special statue or featured picture in your sanctuary. Lighting equipment can also be employed to improve whatever musical performances occur in your place of worship by designating individual soloists or adding visual variety and concentration during the moments of important musical passages and key changes. Theatrical moments can be enhanced with lighting. Spiritual moments can, and often are, theatrically communicated and stage lighting can help promote your message. During these times, as the holidays come closer, it is important to have your lighting systems at the ready for your artistic choices. Statistically, more people come to services during the holidays and, in order to influence them to increase their attendance during the year, the more memorable the holiday experience, the higher the success rate of return will be. Did you know that a sixth century mystic wrote in his book, The Celestial Hierarchy, that light was divine? Why not add more light to your religious campus? 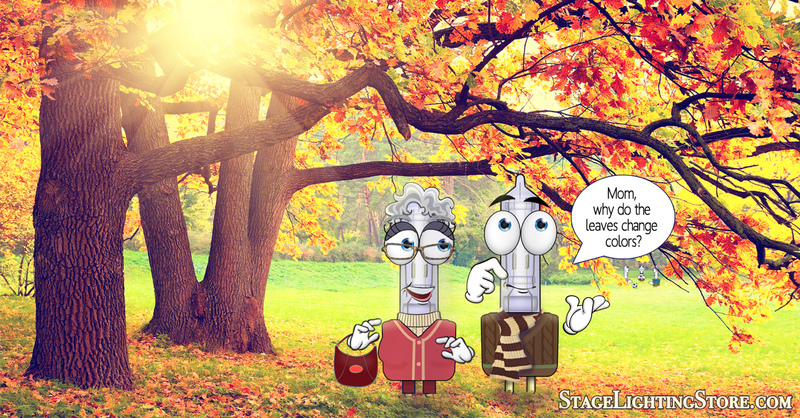 Visit www.StageLIghtingStore.com to see the largest selection of theatrical lighting equipment or give Louie an email at Louie @ StageLightingStore.com and ask a question to one of our advisors for free. It was early in the evening in the autumn of 1621. The inhabitants of the new settlement of Plymouth were busily preparing for the great Thanksgiving feast which was to be held during the next few days. Many of the Native Americans who had befriended the Pilgrims during the past, harsh year were invited to celebrate their survival with food and festivities. Although it was only four in the afternoon, the light in the small, basically one-room homes was almost non-existent. In order to maintain as much heat as possible in the twelve houses which had been built during the past year, the few, tiny windows were covered with wooden shutters. Natural light just was not available. Artificial light was necessary, not only to prepare for the upcoming fest, but also for everyday chores. The candles from England were limited, but the industrious women of the Plymouth colony quickly made their own tapers, and the candlelight was soon shining from the tops of various pieces of furniture. The candles were made from tallow and beeswax scented with bayberry. The wicks came from cotton spun by the women of the household. 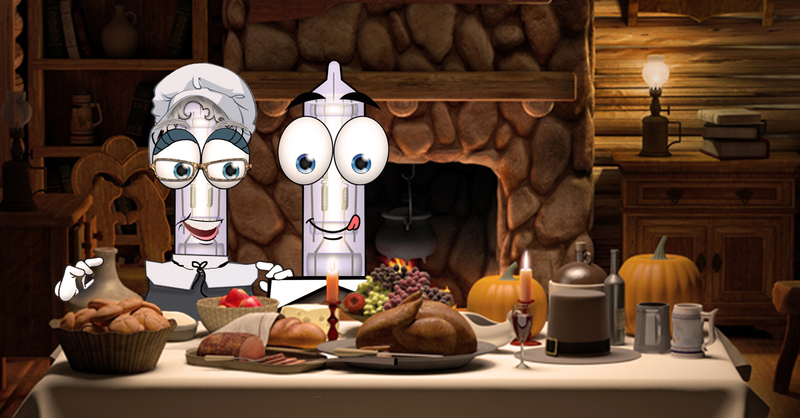 The first candlesticks the Pilgrims developed were extremely primitive being created from root vegetables such as turnips and potatoes. The base of the vegetable was planed flat and a circular hole was cut in the top into which the candle was inserted. Wall-hung candleholders, known as sconces, frequently had polished metal backs to reflect and add to the light. Candles were practically worthless out of doors in Plymouth, but the Pilgrims quickly copied the pine tree torches which were developed by the neighboring Indians. The resin found in the dried branches of the pine tree, especially in the knots, kept these short pieces of branch lit for a substantial length of time. The heart of the pine limb also contained more resin, or pitch, than the rest of the wood. This part was shaved into short lengths by the poorer Pilgrim families and used in place of the more expensive candles. Baskets made of metal containing burning pine knots, and hung in strategic locations, actually became our first street lamps. Although sufficient light was not available for the first Thanksgiving preparations, the celebration was such a success that it is now repeated on a yearly basis. But how much more enjoyable the feast is now with our improved lighting. Now for the theatrically minded, think of how much fun it would be to highlight the turkey with a pin spot and spotlight the other dishes with modern battery operated candles so that we can easily see every scrumptious morsel on the table. Why do leaves change color? What colors should we project in light? One of the most frequently asked questions about the natural world is what causes the flamboyant change of color in deciduous trees, those trees that lose their broad leaves in the fall. The answer to that question is chemical and depends upon the initiation of, and ending of, the seasonal production of food for the tree. All living things require food to continue their existence. Plants are no different. Trees manufacture their own food during the warm months of late spring and summer. The chemical chlorophyll is present in large amounts in the young, newly sprouted leaves, and it continues to be produced and destroyed during the warm summer months. Trees’ leaves are their nutrient manufacturing sites. Taking water from the ground, the plant’s roots direct that water to the leaves which have absorbed carbon dioxide from the atmosphere. Chlorophyll is the key element required for the process of photosynthesis, the combining of carbon dioxide, water and sunlight, causing them to change into the sugar glucose. This glucose is the food which travels from the leaves to the rest of the tree as the plant’s energy and food source. Food is also stored in the tree’s roots during autumn and winter, the time when nutrient production is halted, for use in the following spring. Not only is chlorophyll the major player in the production of a tree’s food thru its role in photosynthesis, chlorophyll cells are composed of green pigment, and they provide the green color one sees in the leaves during the spring and summer. But chlorophyll cells require abundant sunlight to exist and, as fall arrives, the days shorten and sunlight lessens. The green chlorophyll pigment stops being produced and disappears from the leaf. Due to the abundance of the chlorophyll cells in the leaf throughout the warm seasons, other color pigments, whose cells are also present in the leaf at the same time, are hidden. Foremost of these additional pigments are the carotenoids and xanthophylls. People know these pigments best for the colors they produce in fruits and vegetables such as bananas, corn and carrots. The carotenoids and xanthophylls also gradually change the leaf’s color to the early, beautiful yellows and oranges that signal the beginnings of the leaf color season while the green chlorophyll dissipates entirely. Allowing the leaves to live longer and continue to produce energy for the plant, other pigments, the anthocyanins, develop after chlorophyll begins to disintegrate. The bright red and purple leaf colors are from these pigments whose cells’ ph determine the variety of reddish hues seen. Cells that are acidic produce pink to scarlet red colors. As the acidic content lessens, the hues become a deeper red to purple. A fourth pigment found in some trees such as oaks are the tannins, The tannins also develop the golden yellow hues found in trees such as the beech by combining with the carotenoid pigments. Tannins are also always present in the leaves of the trees which they help color, but they, too, must wait until the chlorophyll cells have been removed to be noticed. A number of factors other than chemical influence the hues seen in the fall leaves. Natural events such as droughts, excessive rainfall, severe heat or killing frosts will limit and dull the beauty of nature’s autumn splendor. The most successful color presentation will occur after a wet, but warm, spring, a temperate, evenly moist summer and an autumn with cool nights and sun-filled days. As previously stated, color is determined by the different pigments the leaf contains. Except for chlorophyll not all pigments are found in every type of tree leaves. Only those pigments which are originally in, or are created in, the tree leaves during the growing season will determine which part in autumn’s color palette a specific tree will play. Following is a list of trees and the hues they exhibit during autumn. You might find this useful when designing lighting for a production that needs projected leaves. If you know what sort of trees the scenery is based on, then here is a reference as to what colors you should be projecting.